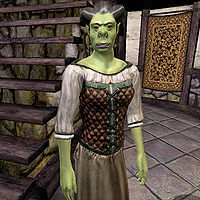 Rogmesh gra-Coblug is an Orc commoner working as a cook at Riverview in Cheydinhal. Her husband is Maknok gro-Coblug, the Riverview groundskeeper. Rogmesh works the late shift at Riverview, which is evident by her late bedtime at 4am. After six hours of sleep she heads upstairs and wanders around Riverview all day long, at times visiting the upstairs area. From 10pm she will stay in the dining room on the ground floor, but will still just pace around. Sundas is her day off and the moment she wakes up, she travels to Newlands Lodge for a bit of relaxation with the other employees and the huge amount of criminal Orcs hanging out in the taproom. She returns back to Riverview and resumes her usual routine at 11pm. Rogmesh wears a middle-class outfit consisting of a quilted doublet, light brown linens, and a pair of braided leather sandals. She carries the key to Riverview, as well as a medium amount of gold. She will introduce herself with: "I'm the cook of Riverside [sic], Rogmesh gra-Coblug. I don't get paid to chat, if you don't mind." If asked about Cheydinhal, she will respond with: "Voranil got parties near about every night, and there's plenty of cooking and cleaning and preparing to be done. If you don't mind."